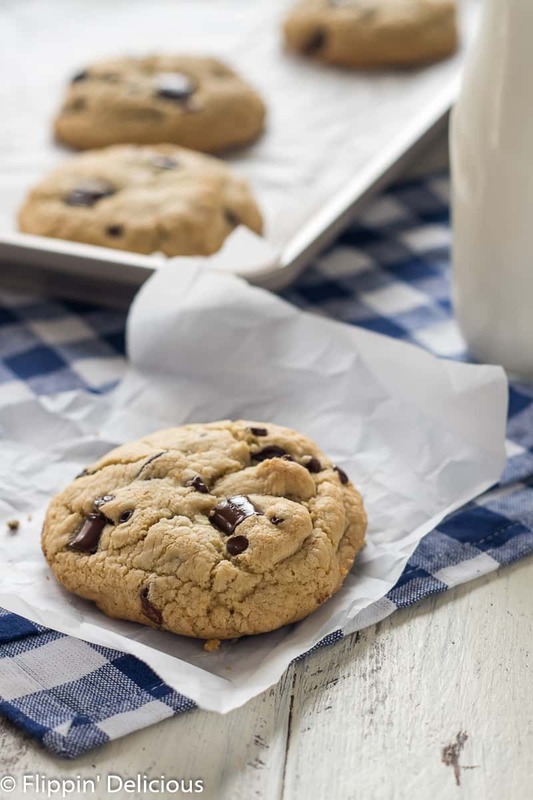 Giant gluten free chocolate chip cookies don’t get any better than this! 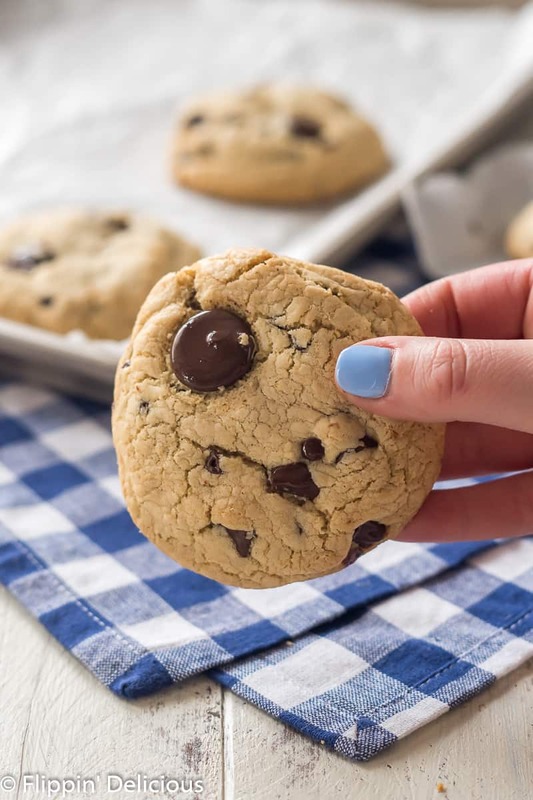 My favorite go-to soft baked, bakery-style gluten free chocolate chip cookie recipe. Easily made dairy free. This really is one of my favorite cookie recipes, hands down! I often use it as a base when I head into the kitchen to create a new cookie recipe. 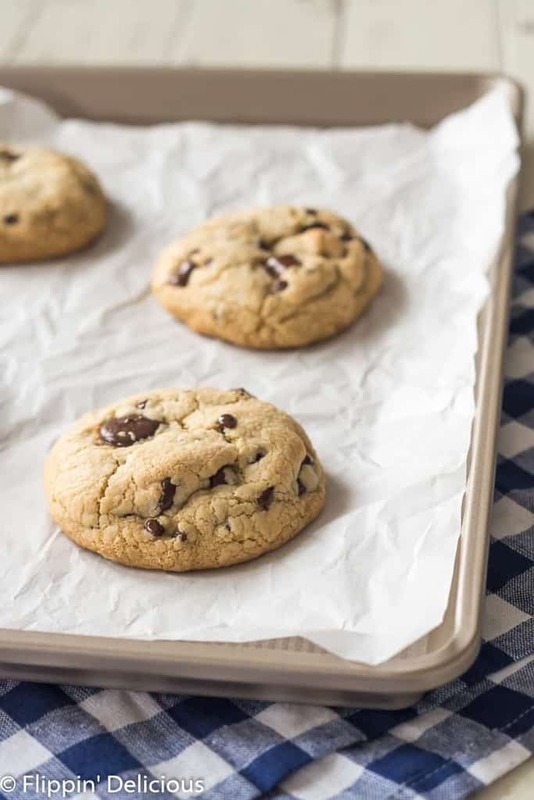 These cookies inspired both my gluten free s’mores cookies, and my gluten free cake batter cookies from my cookbook, The Essential Gluten-Free Cookie Guide. They stay soft for days! 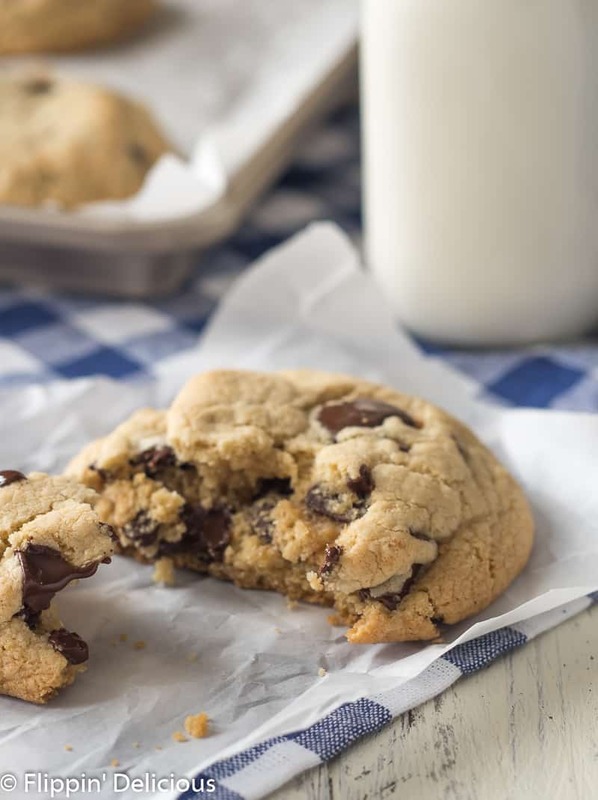 Plus, who doesn’t love a giant chocolate chip cookie? I first developed this recipe when I ran a gluten-free baking company when my oldest was only a year old. Every week I would bake dozens of these giant gluten-free chocolate chip cookies and sell them at local farmer’s markets. I quickly became very popular with the other vendors, because I would trade any leftover cookies with them for their fresh garden veggies. It was a win win!
. If you have ever wanted to try to make your own gluten free cookies, this is the book for you. I decided to let my kids help me pick which recipe to try from this cookbook. For kids, size matters in all things. Who is taller than whom, or in our family’s case, who is now taller than Mom…sigh. My “teen” daughter surpassed me in height last year and my “tween” son is about two inches from this goal as well. He actually walks by me on his tippy toes now, just to let me know he is almost there. When my kids saw Brianna’s photos for the Giant Chocolate Chip Cookie, the choice was made. Bigger cookies are always better, right? 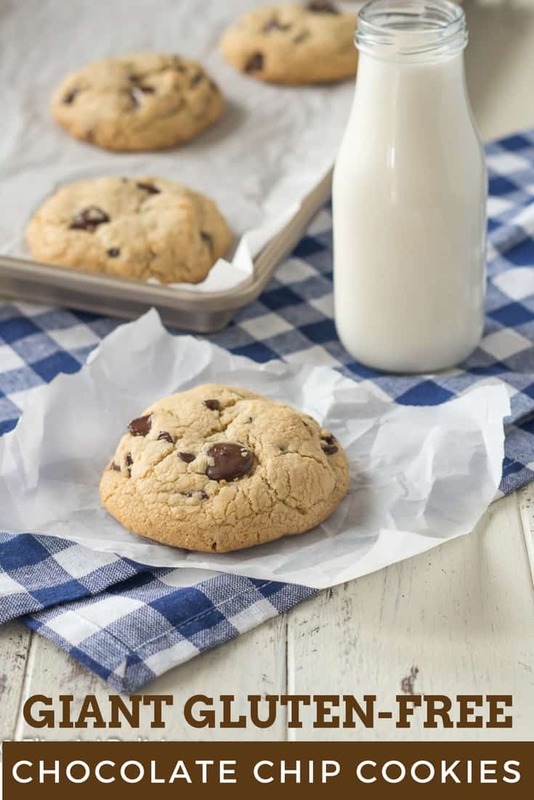 Giant and chewy, gluten-free chocolate chip cookies don't get any better than this! Cream together the melted butter and brown sugar. Our family has been gluten free for over five years. I started my blog because I was tired of getting sick when I dined out. I didn’t know much about cross contamination when we first went gluten free. Most doctor’s offices just don’t give you much detail about how to live gluten free. I had no idea how dangerous cross contamination could be. I started to call around to Bay Area restaurants and asked lots of questions about how they handle gluten free orders, and if they even can adapt menu items. Within just a few months, I had built up a database of over 645 Bay Area restaurants’ safe gluten handling procedures. Someday I hope to expand this database to other cities so it can help even more people. Feel free to come and visit my blog. There are tons of delicious recipes to try :-). Those cookies look super yummy! If the gluten free flour blend I use has xantham gum already, do I need to add the extra 1/2 tsp of xantham gum that the recipe suggests? If you are using a different flour blend that already has xanthan gum in it I wouldn’t suggest adding more. That will probably make it gummy. Not all flour blends work the same, which is why I like using my own blend for these cookies. If the blend that you use is similar to my blend hopefully they’ll turn out beautifully! Absolutely YES! Bigger cookies are always better. These cookies sound perfect! Saving this one! Thanks for sharing at Inspiration Thursday. Hi Lisa, Oops, looks like I missed it. Thank you for letting me know, I am updating the recipe right now. I do make normal sized cookies with this recipe. I usually use a 1 1/2 tablespoon cookie scoop, and bake them for 8-10 minutes. You’ll get nearly 3x the amount of cookies. These cookies came out looking perfect but are very grainy with the King Arthur GF flour blend. Their ingredients are the same as your mix. Is it just a matter of the ratio? Yes, I think King Arthur GF Flour ratio is different with has more rice flour and less starch. I haven’t worked with it enough to know exactly how it would bake up. I’ve heard some people get around the graininess by letting their dough sit out for 10-20 minutes to let the flour absorb more moisture. That will however lead to a cookie that spreads less. The flour you use really makes a big difference. Not all gluten free flours are the same. Thanks for the reply! I just didn’t want to go buy everything to make your mix if the grainy-ness was to be expected. The dough was chilled for at least 30 mins and the shape/thickness was spot on. I’ll have to try your mix recipe and see! These are the best gluten free cc cookies I’ve tried yet! No nut flours, no finicky “soft” butter, no chilling of the dough, cookies that don’t spread into a pancake when baked, good taste! But my favorite cc cookies are brown and crispy on the edges and chewy in the center, and these didn’t quite make the cut for that criteria. They were either soft and not browned, or if cooked longer they were brown but crispy all through. I’m thinking if I add more brown sugar that might do the trick? Hi C, Thanks for taking the time to leave a review. I’m so happy you have enjoyed this recipe! If you want the chewy center and crispy edges, more sugar will do the trick! I actually may suggest more white sugar, but brown will work too. Increase it so you have twice the amount of sugar as the amount of melted butter. 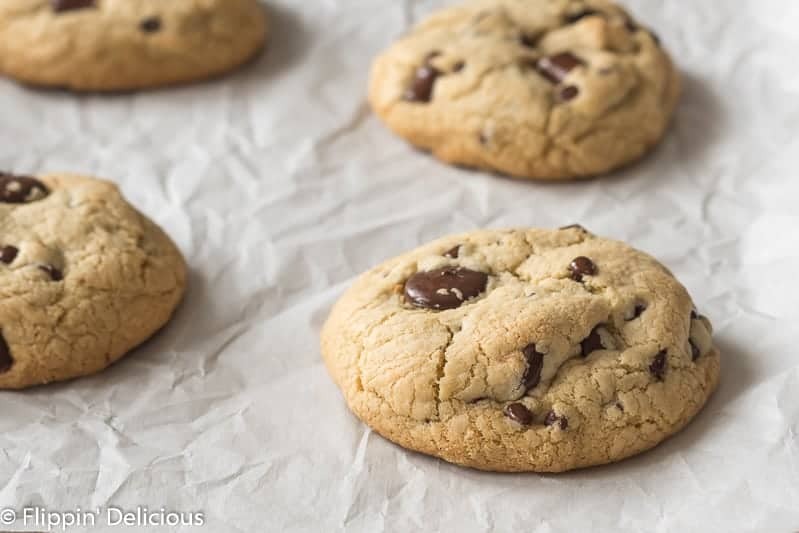 I’ve been working on creating a separate chewy chocolate chip cookie recipe, and that is the ratio that I’ve loved the most.